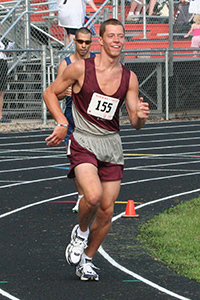 Matthew Minning rounds a turn on his way to a gold in the 10,000-meter run. 25-lap race at Ames High School. This is the first USA Games in Special Olympics history, making Minning’s gold a momentous occasion. His medal was presented by Special Olympics, Inc., Chairman Tim Shriver. In addition, the medals being awarded at the USA Games are the first rectangular medals in the program’s history. Minning will have two more chances at Gold in these Games, running the 1,500 meters and the 4×100-meter relay. The Team Kentucky used a nine-point run the second half to break a 12-all tie and went on to open pool play with a 21-14 victory over Massachusetts. Chad McCarty controlled the boards with 15 rebounds and Dustin Smith led all scorers with 10 points to help the Owensboro-based team cruise to the win. Team Kentucky will take the court again against Oregon at 2:15 on Tuesday. Chris Revay of Burlington shot a 92 in the opening round of the 18-hole individual stroke play competition. In the nine-hole unified alternate shot competition, Jude Zilliox of Alexandria and his Unified partner Chris Frank of Bellevue shot a 65 in their first round. Casie Seifert and her Unified partner Sarah Hawkins shot an 80 in the first round of their flight in that competition. Phillip Riley of Frankfort put on a tremendous performance in the preliminaries on Monday. Riley posted the two highest scores at the meet thus far with a 9.75 on the vault and a 9.5 on the parallel bars in the Level 1 men’s artistic gymnastics competition9.5 on the parallel bars in the Level 1 men’s artistic gymnastics competition. His all-around score of 51.25, gives him a commanding lead headed into the final round on Wednesday. Brittany Snider of Calvert City scored an 8.5 on the vault on her way to a 32.9 all-around score in the women’s Level 2 artistic gymnastics. Russelville’s Lee Dockins saved her best for last, scoring an 8.6 on the floor exercise in her final rotation. to complete a 33.45 all-around score in the women’s Level 3 gymnastics competition. The preliminary scores account for 25% of the gymnasts finals scores. The final round of competition for all three gymnasts will be on Wednesday. Three of four Kentucky swimmers were in action on Monday. Katelyn Hale of Nicholasville and Kyle Gathof of LaGrange swam preliminaries in their two individual events. Hale recorded times of 36.94 in the 25-yard freestyle and 44.10 in the 25-yard backstroke. Gathof swam a 36.99 in the 50-yard freestyle and 53.72 in the 50-yard backstroke. Both Hale and Gathof will swim their individual finals on Wednesday. Lindsay Davis of Crestwood swam a 31.78 in her preliminary heat of the 25-yard breaststroke. All preliminary times are used to division athletes for their final heats later in the week. In addition to Minning’s success, two other Kentucky athletes had good days at the track. Henderson’s Bradley Hope fired the shot 6.42 meters in his preliminary shot put heat. Christy Farwell of Alexandria recorded a very impressive 6.64 in her heat of the shot put. Hope and Farwell were busy today as they returned to the track for the 200-meter dash preliminaries. Track preliminary scores are used only to division athletes for their final competitions. Hope and Farwell will have the finals in the shot and 200-meters on Wednesday.